This is one for all of you hunters out there and I am talking about historical hunters, antique hunters & relic hunters. There seems to be a new pass time sweeping the nation and they call it "magnet fishing". fame. I am just kidding, diamonds are not magnetic but maybe the boxes they come in are. Hmmmm. A little bit of background here. Magnet fishing is just really the looking for stuff (must be magnetic) that can be dredged up out of a body of water from a long long time ago or perhaps just last week. If you have ever been out with a metal detector it is much like that but without all of the sophisticated electronic equipment. Yes sir it it pretty low level barbaric stuff we are going to do here but at least you can take a bit of beer with you and not harm your chances of success any. There is absolutely no form to it and no art as in fly fishing but it gets you out to enjoy nature and the summer days ahead. There may be some rules you should follow through. #1 Go with someone else. This goes without saying as you will be near the water and even if you just twist an ankle it is a good idea to have someone to go for help. Take your well charged phone with you too. #2 Tie a rope off to the end of the magnet so that you can slowly retrieve the items it magnages to find through the water. Something like parachute cord is the best since it is somewhat tangle resistant and strong as can be for its size. #3 Just to keep you from tangling the cord up (I said resistant not proof) get some kind of a contraption to wind it up on. This may also help by giving you a handle to pull on if it turns out to be something very heavy. #4 Neodymium magnets are very strong, Do not place your finger between the magnet and a chunk of metal because at the very least these things can severely pinch you and at the most perhaps take your finger (I am not kidding)! #5 Do not throw your magnet at or near your partner or anywhere near where you see a metal water flow control device. A magnet fishing magnet - CMS Magnetics at magnet4sale.com has a variety of these for sale specifically designed for the avid magnetic fisherman. Thes magnets range anywhere from 173 lbs to a little over 400 lbs. Pull force. Do not be too worried about having to pull a 400 lb. item off of the floor of a lake somewhere. Objects in the water are somewhat buoyant and even though the fishing magnet will hold 400 lbs that is with a clean (not rusted) surface and few irregularities. If you would like start with the smaller magnets until you have an idea what you need. Let us build your magnetic fishing kit. The magnets for magnet fishing are at their base a cup magnet also known as a base magnet Pot Magnet or mounting magnet. These cup magnets have an eye hook screwed into them. These fishing magnets vary in the pull power they have. All 3 Powerful neodymium magnet fishing magnets have a super reinforced eye bolt mount. CMS had its manufacturing group add a weld to between the eyebolt and the magnet casing to ensure a strong connection that other companies do not have. A rope as described so that you can retrieve your magnet and pull anything it finds for you up out of the lake bed. I suggest at least 50 feet because some lakes are deeper than you think. Gloves So that you can scrape the pieces of metal off of the magnet. Some pieces may be very sharp and cut you. This will complete your magnetic fishing set. This sport may be performed off of the dry land, a pier is ideal or from a canoe. Keep in mind that the more unstable the platform is the less chance you have of pulling in heavy objects safely. The eyelets and the flat surfaces of these fishing magnets have a way of getting caught between sticks and rocks in the river or lake. If you tape a plastic bag around the magnet rounding out the edges it cuts your chances of having to cut your magnet away by some measure. Use your judgement in making this decision. Personally I would go with the bag. If you find what may be described as a debris field under the water you may want to run a pattern of retrievals to the left and right of the initial find to see if a Spanish galleon went down in that creek many many years ago. We are going magnet fishing tomorrow in Dallas, Tx at a local pond. Most of the lakes in Texas are man made and usually way less than 100 years old. So, I am not sure what we will find but we will have a great time trying and just see what happens. Video of the CMS Team out at the pond in a park which used to have some homes and an old mill on the property years ago. This video stars Johnathan, our shipping guru. He is going to point out some of the things you need to get started including putting the magnet fishing magnets together and tying them to the rope. For the fishing magnets rope we used a piece of parachute shroud line that is rated at 550 lbs. Tensile strength. One thing we forgot is that some of the items pulled from the lake can be sharp. We now suggest a good pair of gloves to remove objects from the magnet. Johnathan did sacrifice some skin (not shown in the video) when he removed the magnet, but he is fine. 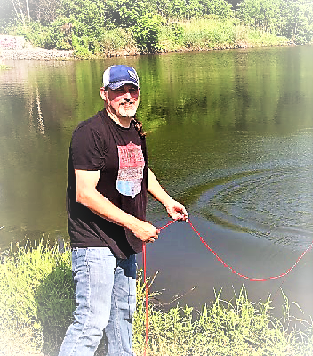 There is little skill involved with this sport but we have found it is quite fun and if you do it in a place that has some history (Revolutionary War, Civil War, old industrial factory…) you just might find some good stuff while magnet fishing with your fishing magnet.